Regardless of how much we love our furniture, a few pieces tend to begin going into disrepair sooner than others. In other cases, we may go gaga over a new piece of furniture item that will come to replace an older unit in our homes. Whatever the case might be, furniture pieces tend to travel every which way inside numerous homes. It’s actually sad to discard good quality furniture that way, yet these pieces regularly take up excessive amounts of room when they are no longer useful in our homes. If your furniture is sturdy and still fully functional, you could sell it to a new home. 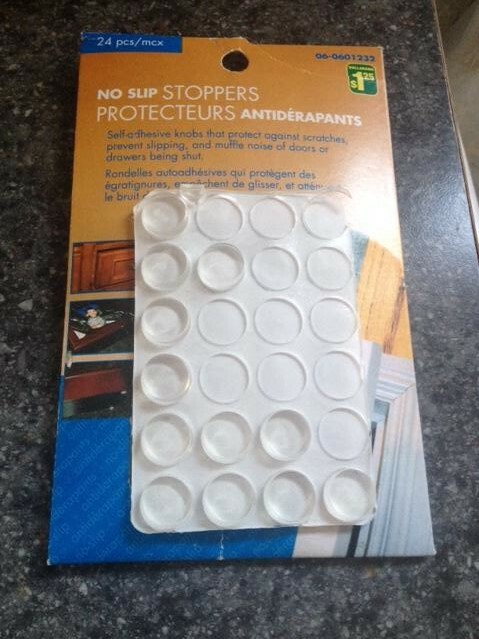 Unfortunately, a significant number of these house hold items simply wind up on the curb for garbage day. Before you toss out your next piece of furniture item, consider these fantastic DIY ventures that particularly re-purpose old furniture pieces. You’ll wish that you had spared a portion of those things from your old collection. Below are two weekend DIY projects that we recently completed by up-cycling old pieces we already had around the house to look new again. Our family has had this piece for over 17 years. 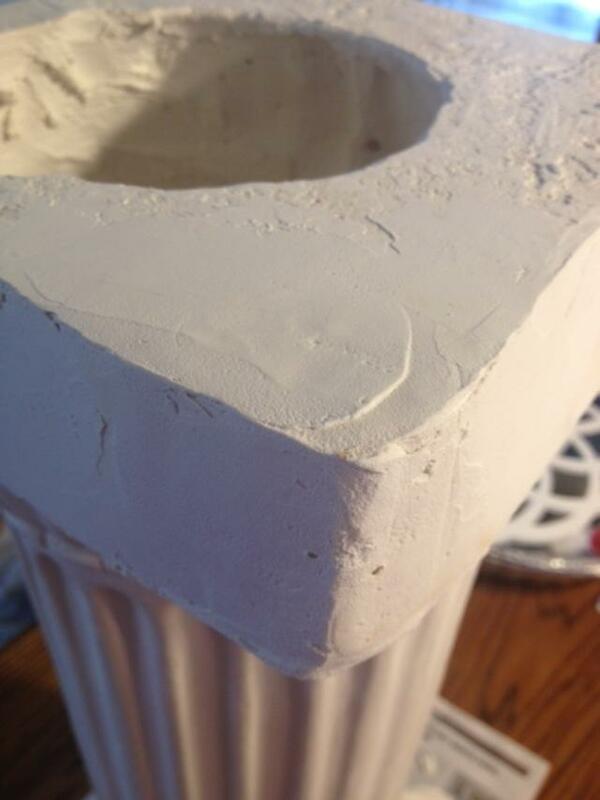 We actually purchased this pillar at a home and garden center in the damaged section of the store. Got a great deal on it and brought it home. 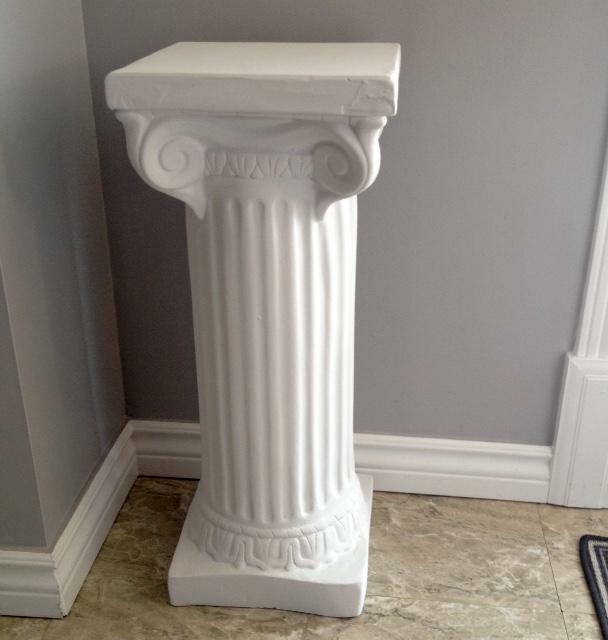 This pillar was used as a decorative decor piece in our home for years. It held a beautiful blue glass vase with an arrangement of large silk sunflowers in it and was showcased in our living room until it ended up in our basement along with our many other collections of pieces that we just didn’t use anymore. My wife had a hard time deciding on whether to sell it or hold on to it for future use. During this years HUGE spring cleaning and de-cluttering process, we decided to keep this piece by repairing, up-cycle and giving this piece a new function and home in the house. And we’re sure glad we did! Repairs were made to rebuild a damaged corner. We had left over paint from a previous project with great results and decided to use it again on this particular project. Chalked Ultra Matte Paint creates a matte finish that dries to a velvety smooth finish. It transforms and rejuvenates furniture and home decor, creating a unique one of a kind look. 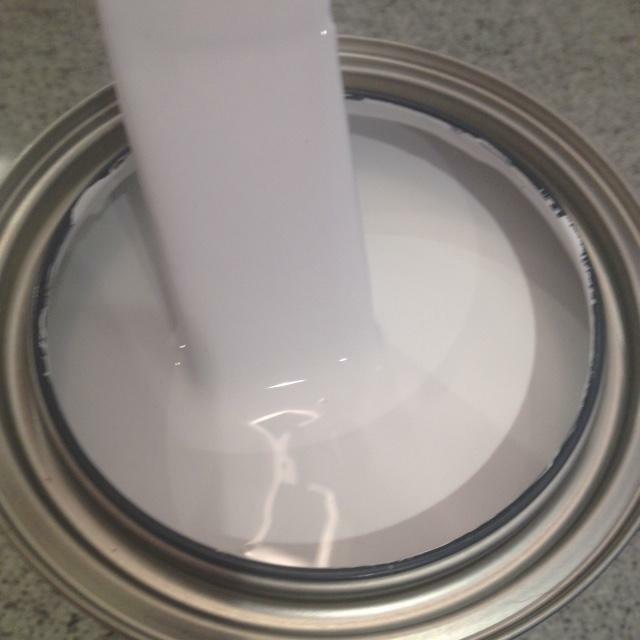 Why Paint with Ultra Matte Paint in Linen White? 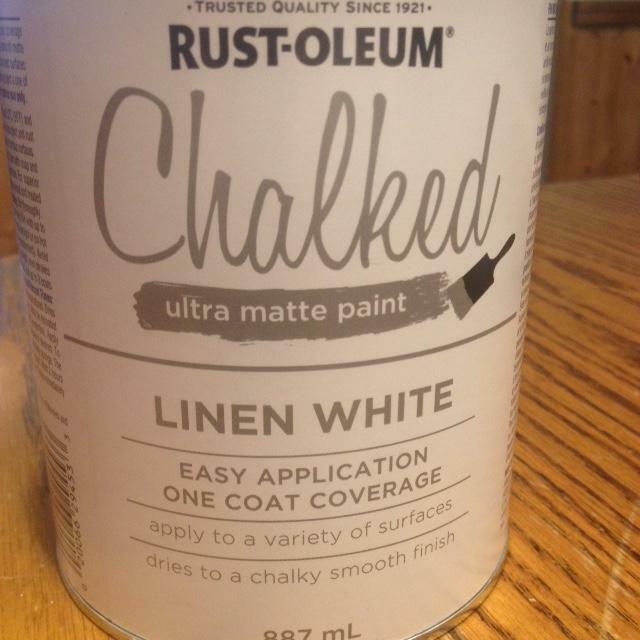 Three great reasons why we chose this paint to get this DIY weekend project done. 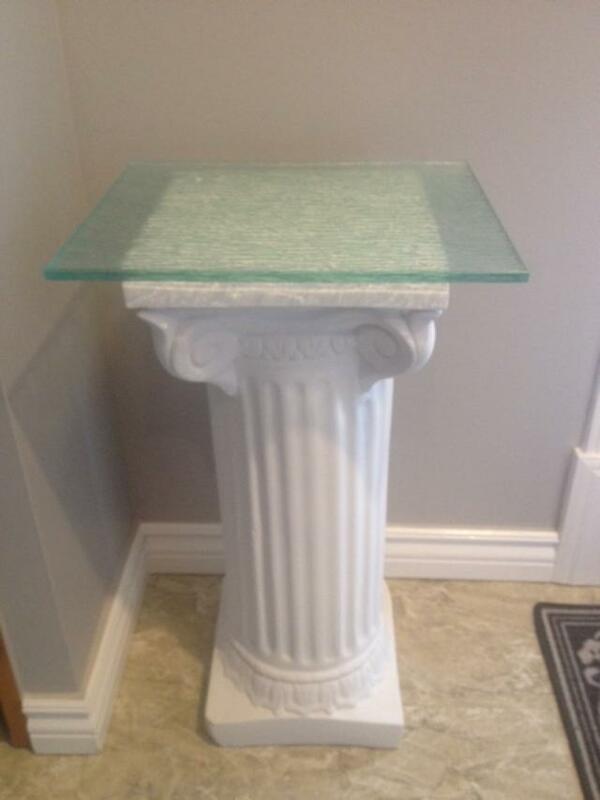 A beautiful custom fit piece of glass was cut and purchased to add more area space to the top of the pillar along with helping to give this piece a new unique one of a kind look and to fit into the new chosen space. Inexpensive self adhesive Non-Slip Stoppers were attached to the top of the pillar to help prevent the glass from slipping. And voila! 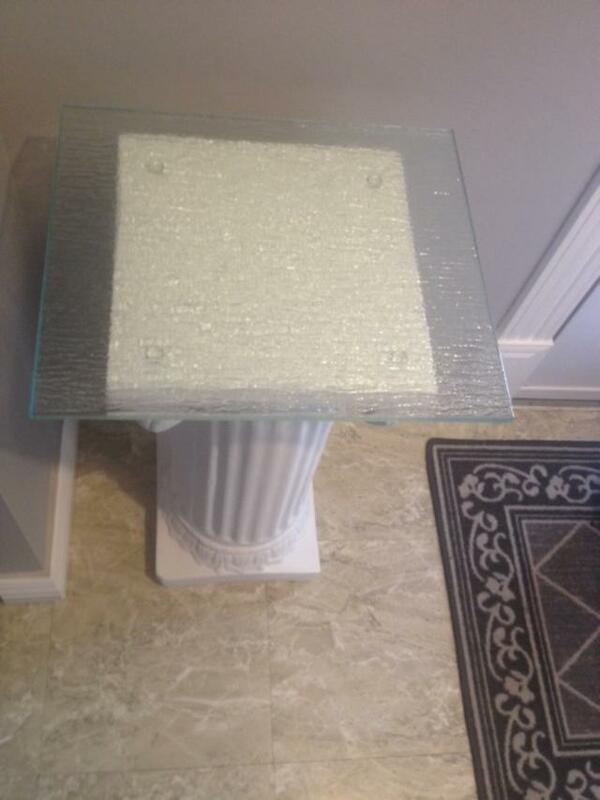 Our New Pillar Accent Table is done. Love the new fresh clean look, new function and home where we can enjoy it for many more years to come! Now this was a fun project to complete. 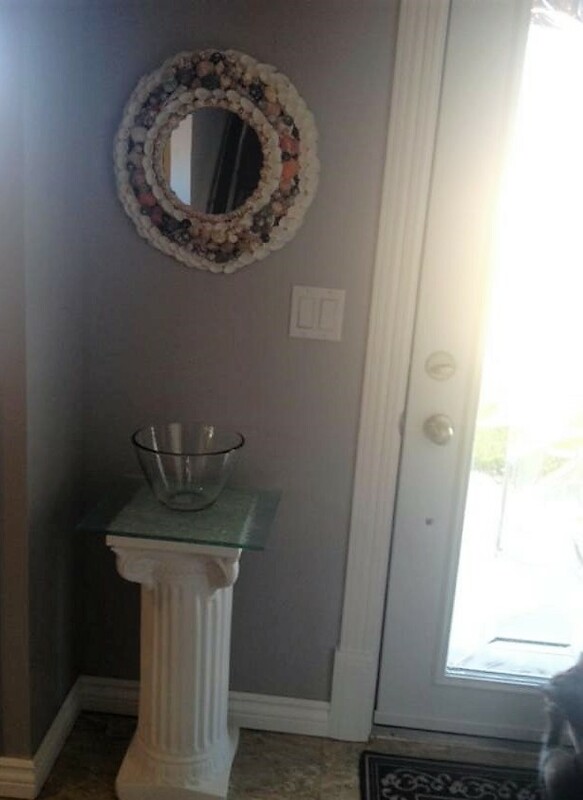 We had an old mirror hanging around and decided to give it a new look that would compliment along side with our new pillar accent table. We covered the mirror glass in order to protect it with the help of painters tape and some paper. 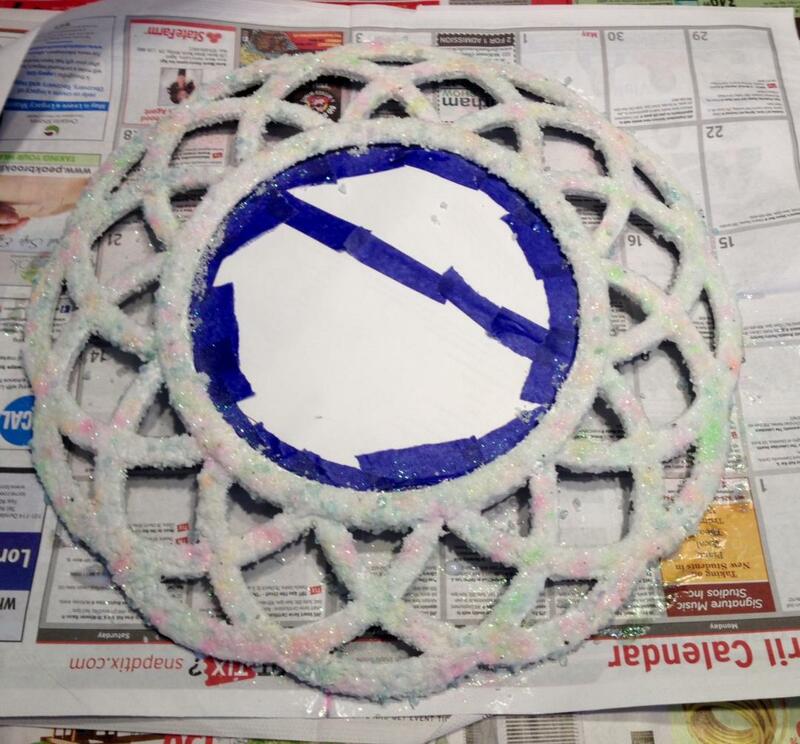 Glue and sand was added to the mirror first to help tie it in with the seashells. 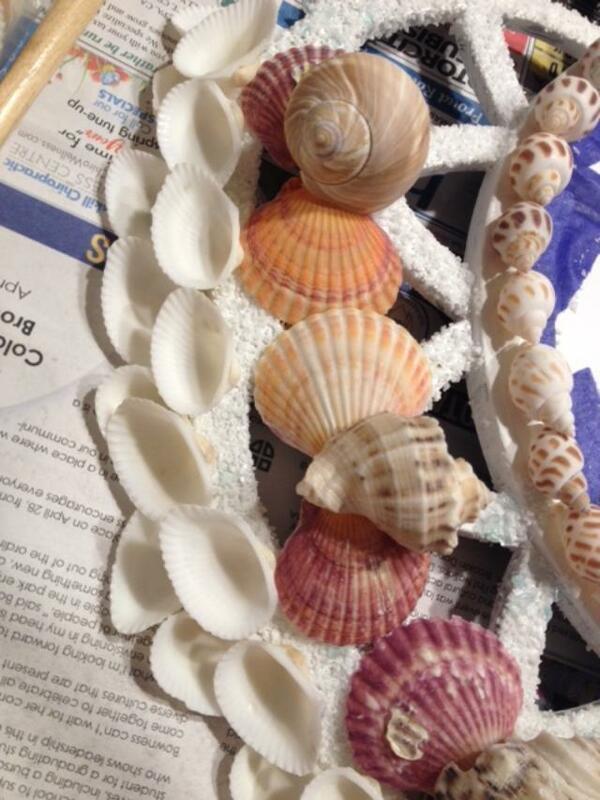 Once dried, we created a pattern of shells around the mirror to figure out where which shells were going to be placed. 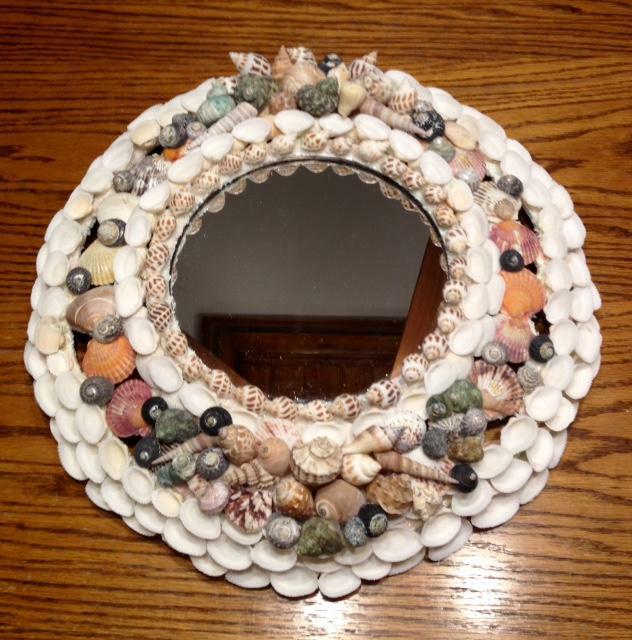 Many, many seashells and lots of glue sticks later along with a lot of patience, our seashell accent mirror was finally completed. 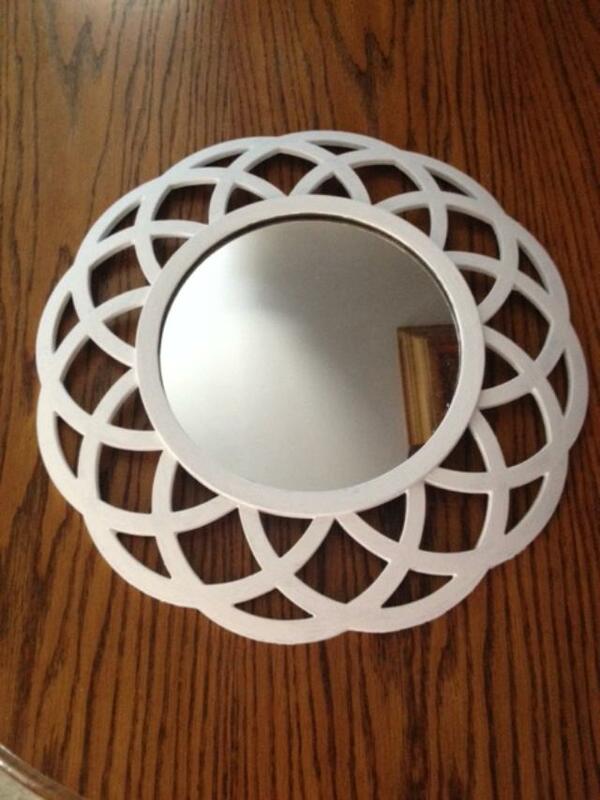 It was placed above the new pillar accent table in the tiny front foyer area. Love the new look of this small space and being able to turn something old and turning it into something new again. Old furniture can be an eye sore, but for the crafty, old furniture items are an opportunity to transform the old into something new and delightful. Whether you just want to dress up an old piece or create something entirely new from its parts, just remember that with a little bit of motivation, hard work and imagination, the possibilities are endless.